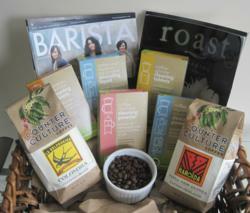 Post ‘My Mom Loves Coffee’ on Facebook, win a chance to satisfy mom’s gourmet caffeine fix. Moms are 24/7 multi-taskers and quality coffee, brewed in a pristine machine, is a simple luxury that helps keep us on the go. Urnex Brands, the makers of Full Circle, the only eco-friendly portfolio of coffee and espresso cleaning products, launches its Facebook “Perk Up Your Mom” giveaway, which offers the chance to pamper your mom, as well as her morning brew. 3. The Full Circle portfolio of five eco-friendly home coffee and espresso machine cleaning products. Two winners will be chosen at random and notified via Facebook on Mother’s Day – Sunday, May 13, 2012. On Friday, May 11, be sure to visit the Urnex Facebook page to meet some of the talented moms that keep Urnex brands buzzing. Full Circle provides a solution for better tasting coffee, which results from having a clean machine. Full Circle’s complete line of environmentally-friendly, odorless cleaning products are formulated from naturally occurring, sustainable and renewable ingredients. These products are available on-line and in-store at Williams-Sonoma, as well as retail and e-commerce locations nationwide. The line of environmentally conscious Full Circle products was developed by Urnex Brands, respected cleaning experts in the commercial specialty coffee market since 1936. To learn more about Full Circle coffee and espresso equipment-cleaning products, visit facebook.com/urnexbrands or email info(at)urnex(dot)com.